The iconic Park Hyatt Sydney has recently reopened after the largest and most comprehensive transformation in its 21 year history. Every aspect of the hotel has been dramatically transformed, setting a new benchmark in contemporary 5 star luxury. Renewed guest rooms feature floor-to-ceiling glass that open onto private balconies, honouring Park Hyatt Sydney’s coveted harbour front location and views of the iconic Sydney Opera House directly opposite. Renowned Australian artists including sculptors, painters and a photographer have been commissioned to create artwork especially for the new hotel. Sunset Pools were selected to remodel and transform the Hyatt’s outdoor recreational and relaxation area, including the installation of their distinctive steel shelled rooftop swimming pool and guest’s spa. Discover for yourself how Sunset Pools’ latest creative integration and pool building techniques will add value and style to your next project. Call 1300 000 412 or complete the enquiry form right now. What appears as an apparently straightforward rectangular pool is in reality a steel shelled trapezoid (having no parallel sides), and is a significant design and engineering achievement that takes full advantage of the hotel’s available rooftop space. 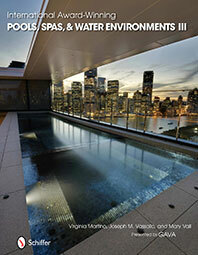 Following 13 months in the design stage, and in close cooperation with the project architects and building contractors, this Sunset Pool was prefabricated in three sections entirely from steel, and given a class II sand-blasted interior finish to create the mechanical key necessary to take its waterproof fibreglass resin lining. The pool’s filtration equipment, steel balance tanks and shell structure sections were then craned onto the roof and welded together on site before final preparation for its bespoke lining. Provisions for underwater Loumaskape lighting, pool heating and water sanitation transfer lines, plus emergency/maintenance drainage, all needed to be confirmed prior to shell construction. This exacting and unusual project mandated close attention to critical weight distribution criteria to ensure that the existing building structure was not compromised as a result of Sunset’s extensive swimming pool, spa and sundeck refurbishment. The pool is 1.2 metres deep throughout, except for an integrated perimeter ‘walk on’ bench extending the entire length of its longest (16 metre) side. The bench depth is just 600 mm a practical sunset inclusion that promotes pool access and enjoyment, whilst evenly reducing water volume and pool mass along its entire length. In addition to the pool itself the design called for no less than three holding/balance tanks, all maintained at the same level to evenly distribute weight. In addition, the hydraulics design needed to take into consideration the combined water volumes (and weight) in pumps, valves, gutters, pipes and returns. The pool’s ‘Prominent’ filtration and sanitation system runs continuously 24/7 to take account of any anticipated bather load. 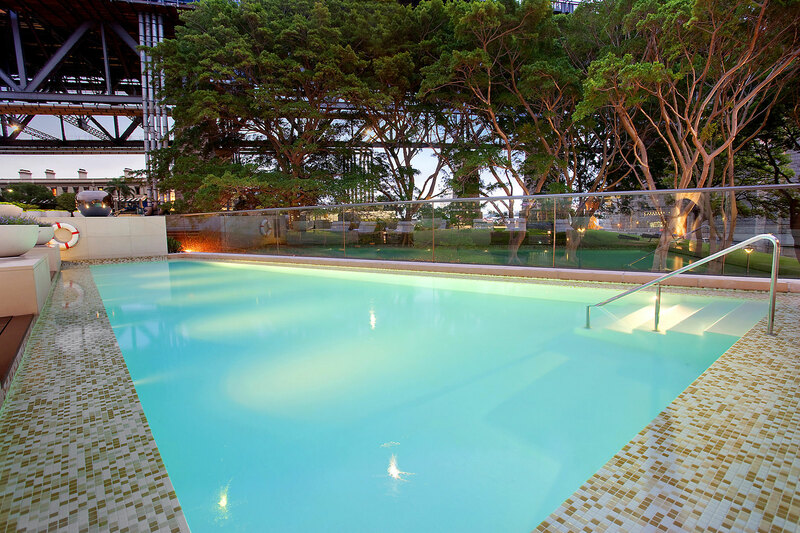 The swimming pool is ingeniously heated with a heat exchange system that utilises residual heat from the hotel’s existing hot water service therefore, it costs the hotel operators nothing to keep their new pool at an even temperature for year-long enjoyment by their privileged guests. The swimming pool and nearby spa pool’s heating, sanitation and water management hydraulics are all housed in a control room directly under the main pool shell. 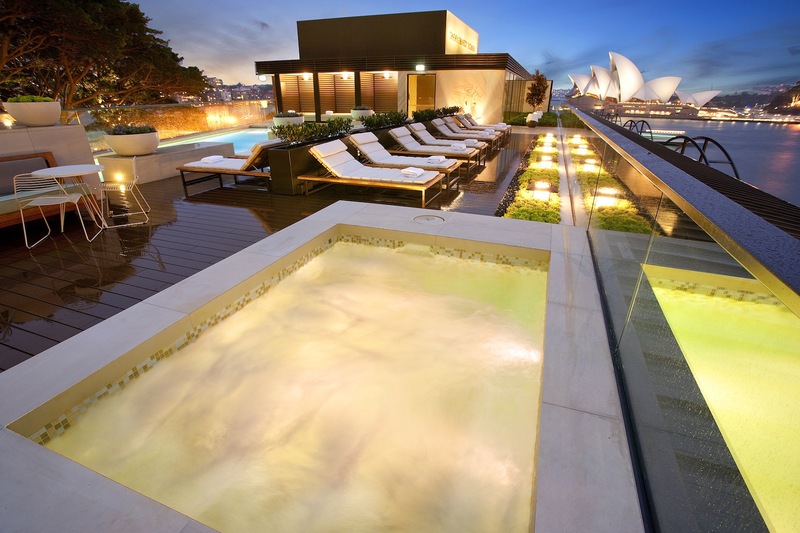 Once installed on the Park Hyatt’s roof deck the pool shell’s interior was meticulously cleaned in preparation for its waterproof resin lining and bespoke tiles. 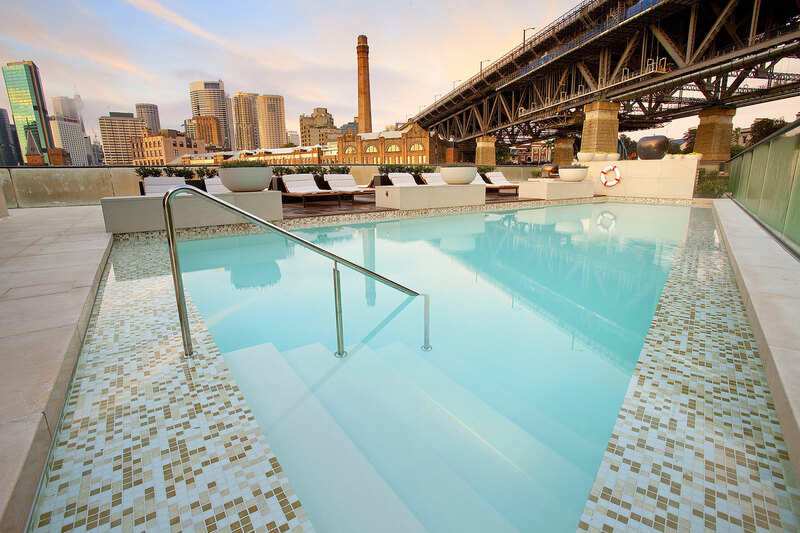 The Spanish mosaic tiles were specially designed and manufactured to match the Park Hyatt Hotel’s new colour scheme, and airfreighted to Sydney to meet the projects finite time constraints. 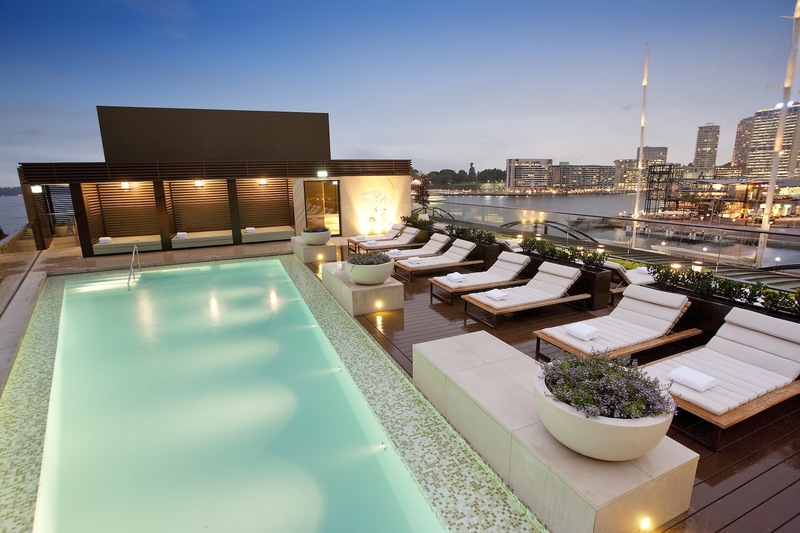 The hotel guest’s new rooftop spa pool has a more traditional Sunset standard structure, double “N” grade steel reinforced vibrated concrete with Xypex added to significantly exceed Australian standard (AS1926-3-2011). Specialised 80mm hydraulics, rated at 500KPA to fully comply with Australia’s new standards, plus Sunset included extra outputs, to eliminate any possibility of patron entrapment. 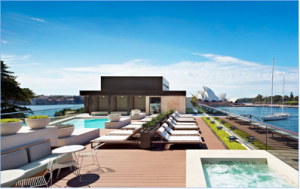 The hotel’s restaurants and bar, private dining rooms, day spa and recreational facilities have also been enhanced to reinforce Park Hyatt Sydney’s position as one of Australia’s premier international 5 star hotels. Travel + Leisure 2011 World’s Best Service 2011. Discover for yourself how Sunset Pools’ latest creative integration and pool building techniques will add value and style to your next commercial pool renovation. Call 1300 000 412 or complete the enquiry form right now.